Okay so I know I look a bit like I'm dressed as a school girl here but to be quite honest that was intentional. There's something so stylish, it now seems, about my old school uniform that I do find myself taking influence from it… the oversized jumper, the palette of navy, black, white and grey, the ribbed ankle socks, (sometimes with a frill), those loose smock style summer dresses in blue check… a collar, to this day I feel odd leaving the house without a collar around my neck. 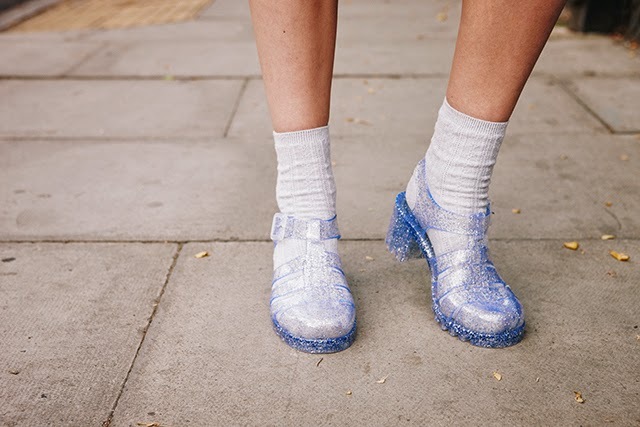 I love an outfit that evokes nostalgia, and when I first put on my new pair of glittery jelly shoes after all those years, (I think I had a pair when I was about five), I smelt that plasticy smell and for a second felt five-years-old again! These are from Shoe Zone and were just £9.99, an incredibly cheap answer to the jelly sandal trend! They also stock some fab two-buckle sandals, which I've got my eye on in black, white and pink!